The Mayo Clinic Center for Regenerative Medicine and colleagues at the National University Ireland (NUI) Galway have signed a formal memorandum of understanding (MOU) to pave the way for joint clinical trials using regenerative therapies. The MOU follows years of close collaboration with NUI Galway’s Regenerative Medicine Institute (REMEDI) and the Network of Excellence for Functional Biomaterials (NFB) and will focus on adult stem cell therapy, gene therapy, biomaterials and biomedical engineering. 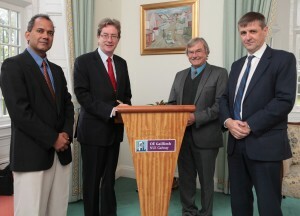 Furthermore, the agreement facilitates ongoing student and staff exchange between Galway and the United States. Anthony Windebank, M.D., deputy director for Discovery, Mayo Clinic Center for Regenerative Medicine, and Professor Timothy O’Brien, director of the REMEDI, were among those present at the signing in Galway. 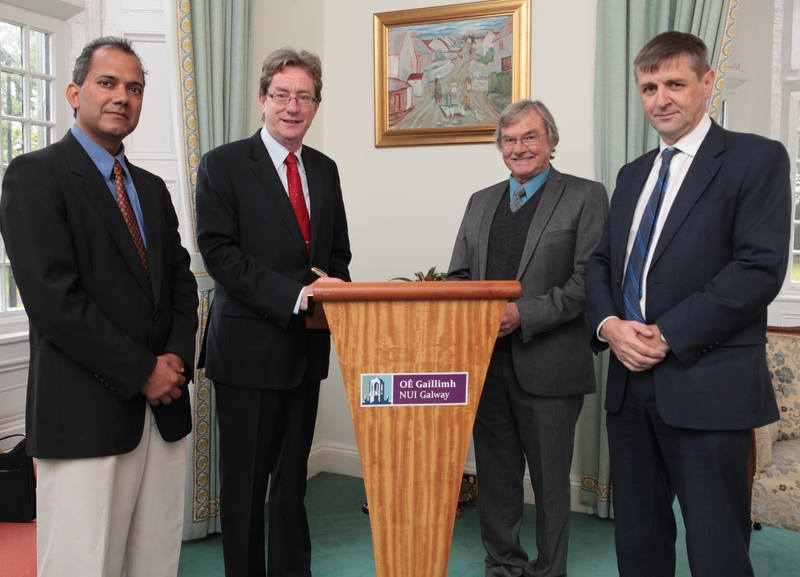 Pictured at the signing: Prof. Lokesh Joshi, Vice President for Research, NUI Galway; Dr. Jim Browne, President, NUI Galway; Dr. Tony Windebank, Deputy Director for Discovery, Mayo Clinic Center for Regenerative Medicine; and Prof. Tim O’Brien, Director of REMEDI NUI Galway. The U.S. Food and Drug Administration and the European Medicines Agency are making efforts to streamline and facilitate introduction of new therapies on both sides of the Atlantic Ocean. Carrying out these approval processes and completing joint studies will facilitate more rapid introduction of new therapies for patients. Welcoming the agreement, Andre Terzic, M.D., Ph.D., says, “Mayo Clinic has prioritized the development of regenerative medicine clinical applications as a critical strategy for meeting the future needs of patients. Sharing experience through international collaborations fosters advances in this emerging field of science and medicine” Dr. Andre Terzic is the Michael S. and Mary Sue Shannon Family Director, Center for Regenerative Medicine, and Marriott Family Professor of Cardiovascular Diseases Research at Mayo Clinic. The signing comes on top of the recent announcement of a new $16 million agreement between Mayo Clinic and Enterprise Ireland to advance novel medical technologies originating from Mayo Clinic with the aim of creating several high-value medical technology spin-off companies.